Heads up – if you’re looking for a Taylor Swift album to cry to and get over your ex with, this isn’t it. Go listen to ‘White Horse’ or “All Too Well’ for that because you won’t find that within Taylor’s defiant new album. That’s right, for quite possibly the first album in her musical career, she’s no longer singing heartbreak anthems about being jilted by a former lover. Instead, she’s either throwing her affection at new squeeze Joe Alwyn, or knives at critics’ and frenemies’ attempts of trying to tear her down. We take a listen to the 15 gripping cuts to see exactly what self-professed “New Taylor” has up her sleeves this time around. Taylor kicks off her brand new image with a bold profession of love for her new man, spilling tea within the first 30 seconds of the song. “Younger than my exes but he acts like such a man”, she proudly sings before cooing her delight at her newfound romance over a heavy industrial-electro beat. Coming off as the distant cousin of the similarly-futuristic ‘Bad Blood’ clip, the Tron-inspired music video might not quite fit the song’s flirty theme. But the single sure is an explosive way to open the album. “Let the games begin” indeed. Who it might be about: Other than an one-liner allude to ex-boyfriend Calvin Harris, the track is just the first of many love letters to come about Joe Alwyn. “I swear I don’t love the drama, it loves me!”, Taylor declares on the first song on the collection that tackles the album’s title and theme. But make no mistake – even when she’s singing about her “big reputation that precedes her”, she still ties it back to being hopeful that her famous fling won’t be judging her based off what he’s heard about her. He shouldn’t though – especially when Taylor’s enlisted killer testimonial verses from rapper Future and Ed Sheeran for this brazen R&B track. Can you imagine this trio killin’ it in a potential music video? Who it might be about: “It’s like your eyes are liquor / it’s like your body is gold”. Yup, Taylor’s likely still swooning over Joe Alwyn. Remember when Taylor said “Old Taylor is dead”? The first sign of her R.I.P. status comes apparent on this dark jam. She cheekily questions her haters’ views of her past mistakes by unapologetically asking “why’s it feel so good?” before a scattering trap drop. Oh, and the line “They’re burning all the witches, so light me up” is so ridiculously clever, expect it to be the next overused Instagram caption following ‘Blank Space’s “But darling I’m a nightmare dressed like a daydream” by millennial Swifties. Who it might be about: With her love-hate relationship with the media, we can’t think of anyone in particular she’s aiming the song at other than her harshest critics. A simmering synth lures us into Taylor’s lair of temptation with lyrics like “For you, I would cross the line / I would waste my time”. Echoes of a coy Taylor is cranked up to overdrive and moving effect, calling to mind the likes of Imagine Dragons or AWOLNATION’s alt-pop sensibilities. In fact, the seductive track wouldn’t be out of place as a sequel to her equally racy track ‘I Don’t Wanna Live Forever’ with ZAYN from the Fifty Shades Darker soundtrack either. Venturing into further unfamiliar musical territory is ‘Delicate’, a trop-pop ditty that lightens the mood from the previous tracks and jolts you into an undeniable head-bop. Taylor captures the uncertainty of a budding romance with intense accuracy by second-guessing innocent actions and dreaming up fairy tale scenarios over bubbly, laid-back synths. And by the time the repetitions of “isn’t it?”s draw the feel-good track to a close, don’t be surprised if you catch yourself in a smile. Awww, Taylor! Who it might be about: Joe Jonas. Just kidding, it’s definitely about Joe Alwyn, again. Guns! Games! Crimes! The first single from Reputation is still Taylor at her utmost savage. The haunting track still sounds as fresh as it did when it was first released back in August, and perhaps summarises her present-day narrative most perfectly. We’d be sleeping with one eye open if we were any of Taylor’s adversaries – just sayin’. Taylor sings about falling in love on this dreamy number. While it doesn’t stand out upon first listen quite like the prior tracks, there are still golden glimpses of her usual ingenuity like “You did a number on me / but honestly baby who’s counting?” and her restrained approach of her vocals. Who it might be about: Considering it’s about a new romance, we’re guessing… Joe Alwyn? We all got an early listen to this unabashed declaration of a crush – complete with the butterflies, jealousy and shameless compliments that come along with having one. “You’re so gorgeous!”, Taylor gasps wide-eyed in infatuation, channelling all our inner thoughts upon seeing that eye-candy walk past. It’s a cheeky, yet honest take on a feeling everyone can relate to, and when it features her cats and a triangle’s “ding”, how could anyone dislike this track? Who it might be about: Joe Alwyn. But we’re so glad she delivered an anthem for us to apply it for anyone we might be crushing on too. Producer Jack Antonoff’s influence is front and centre on this love story gone wrong. But comparisons to Bleachers’ track ‘I Wanna Get Better’ aside, the song differs in its narrative about a doomed romance. “I wanted to leave him / I needed a reason”, she laments, before hopping into the title’s getaway car and pursuing a new relationship before fully leaving a previous one. Call it unethical, but we’re all for this dramatic heist that plays in a similar vein to one of her best songs to date, 1989‘s ‘Style’. Who it might be about: Overlapping romances could only mean one thing: Taylor was infamously noted for jumping from Calvin Harris into the arms of Tom Hiddleston, making Tom the man behind the wheel. The stirring drums from ‘Out Of The Woods’ make a welcome comeback on ‘King Of My Heart’, backed to Taylor proclaiming her devotion to her love. By now, it’s apparent that she’s head over heels in admiration for her man, as she ditches the high life for her idea of luxury: his lips. Who it might be about: Taylor is undoubtedly the current Queen of Pop, and Joe Alwyn’s the king of her heart. The only other love song on Reputation that doesn’t touches on Joe Alwyn is seemingly here, with references to dancing through avalanches, invisible lockets and inklings of a bad ending over a electo-pop instrumental. Who it might be about: A love gone to waste, we say this is about her whirlwind summer 2016 romance with Tom Hiddleston. ‘Dress’ is a slow burner with lyrics so sensual, it apparently made Taylor’s mom Andrea leave the room during one of Reputation‘s Secret Sessions to avoid feeling embarrassed. The lines in topic are likely the chorus of “Only bought this dress so you could take it off”, which verges on NC16 terrain and serves as yet another reminder that Taylor is all grown up. Who it might be about: It’s not exactly about Joe, but rather, her passion for him – which reveals enough while still leaving us dying to know more. Not since Red‘s ’22’ have we heard Taylor so relentlessly in-your-face poppy until now. Taylor’s squad-parties of the past play setting to this playful track upon its first verse, before taking a sharp turn by the second one to aim shots at nemesis Kanye West. Alluding to her caught-on-camera phone call conversation with the rapper, she snarls “Friends don’t try to trick you/Get you on the phone and mind-twist you” and cuts off what remaining fake friendships she’s had. Who it might be about: Her overplayed beef with Kanye West and how Kimye backstabbed her. We’re guessing a second reconciliation is out of the question? “They took the crown but it’s alright”, Taylor shrugs in ‘Call It What You Want’. It seems the turbulent year she had amidst media-created scandals that’s documented in earlier songs of the album is finally done affecting her. People might call her a liar and take swings at her character, and she’ll simply retreat into her safe haven of Joe Alwyn- shaped familiarity. Who it might be about: The world’s obsessive opinions on her love life. But Taylor doesn’t care, she wants us to know she’s living her best life. To end off an album chock full of hard-hitting numbers and up-tempo hits can be tricky, but the stark contrast of this piano-driven ballad works. ‘New Year’s Day’ takes an intensely intimate look at Taylor’s life that people don’t see – the aftermath of a grand party or the comfortable silence at the back of a cab. The unassuming track tugs at heartstrings when you least expect it, with Taylor flipping the focus back at her fans whose own reputations and self-esteem might get hurt by the harsh realities of growing up. Who it might be about: “But I stay when it’s hard or it’s wrong or we’re making mistakes”, she shares, offering another life lesson realised when you step back and listen to the big picture. She isn’t just singing about her own reputation this whole time; she’s singing about how we view the world and how the world sees us back. And that even in the worst of times, it’s important to be true to oneself. VERDICT: From the lack of media interviews to her resistance against being seen in public, Taylor Swift’s take on this album speaks louder than words and loudest in its most consistent body of work yet. Once dreaming of fairy tale dreams, this is Taylor embracing the dark side of adulthood with sharp observations, impeccably honest songwriting and an evolution in sound. And with a predicted first week sales of 2 million copies in the US alone – the most in history – Reputation is proof that while Taylor can be invincible, she’s also after all, only human. Get Taylor Swift’s Reputation on iTunes now. What is your favourite track? Tell us in the comments below! With his swoon-worthy good looks and down-to-earth personality, it’s no wonder everybody just couldn’t get enough of Park Seo Jun. In town as part of his ‘Guess Who?’ fanmeeting tour, the Fight For My Way actor certainly lived up to his title of the ‘nation’s boyfriend’ as he charmed a crowd full of adoring fangirls (and boys). From holding an impromptu fansign onstage to personally whipping up a meal for lucky fans, it’s hard not to fall in love with the 28-year-old. #1 He has a way with words. Pickup lines ain’t got nothing on our resident heartthrob. “What’s that on your face? Handsomeness!” yelled a fan in the audience. Blushing at the unexpected comment, the actor sheepishly replied with wit: “Ah, I forgot to take off my handsomeness today.” Such a tease – and this was just one of the many hilarious banters that night. Read on! #2 He’s a total sweetheart. 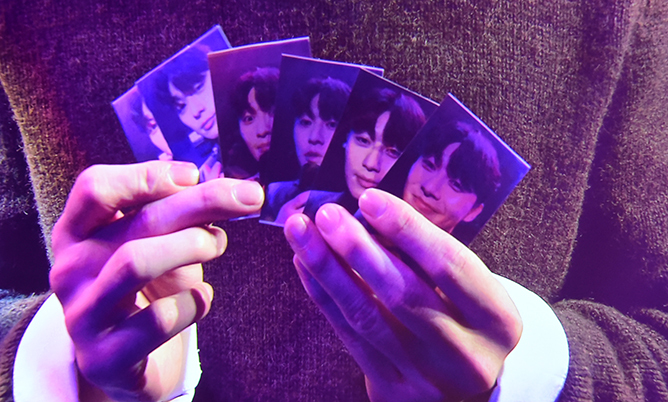 The chap might’ve claimed that he’s not good at selfies (“I just take a lot of photos and pick the best one!”), but we beg to differ after seeing his attempt at taking one right on the spot, which were presented as exclusive signed polaroids to six lucky fans. Not only were they able to take a piece of him home, they were also given the ultimate fan service treatment by the actor himself even though he was not obligated to – giving the sweetest hugs, posing for selfies and even letting them record videos of him onstage. Now, can you blame us for being smitten? #3 And quite the gentleman. During the first games segment, it was a dream come true for one lucky fan as she interlocked hands with Park Seo Jun for a good 40 seconds (yes, we counted) while the latter escorted her all the way to the side of the stage – not forgetting to take an individual selfie and giving her a big hug before sending her off, much to the envy of everyone else present. What a gentleman! #4 Yes, he can actually sing. Sure, we all know Park Seo Jun’s a great actor – but who knew he could belt out a tune just as well? Showcasing his soothing vocals, the multi-talented lad serenaded the crowd with a live rendition of the OST ‘Come Into My Heart’ from his 2014 drama Witch’s Romance, and boy can he hold those notes! Just what else can Park Seo Jun not do? He acts, he sings, and now he makes pasta? Talk about perfect husband material! 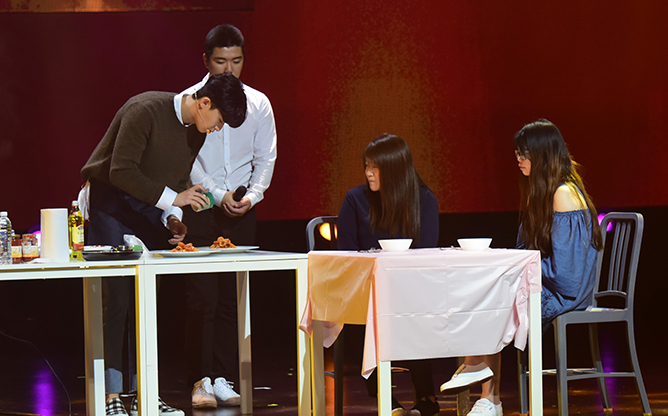 Chef Park impressed the audience with his culinary skills when he whipped up a romantic meal for two lucky fans right in front of them – one of them jokingly retorted that “it needs more salt” while the other animatedly exclaimed that it was “the best pasta” she ever had. Although we didn’t have the privilege to sample his creation, it’s safe to say it looked pretty legit! #6 … with plenty of aegyo. We’ll be honest, this was the moment we were all waiting for. One of the forfeits of the previous game was to reenact the famous aegyo scene between Ae Ra and Dong Man in Fight For My Way – the struggle was real as he attempted to shake off his embarrassment, but he managed to pull it off in the end. Watch the aww-inducing clip below and try not to squeal. Ae Ra would be so proud! #7 But he has his serious side too. 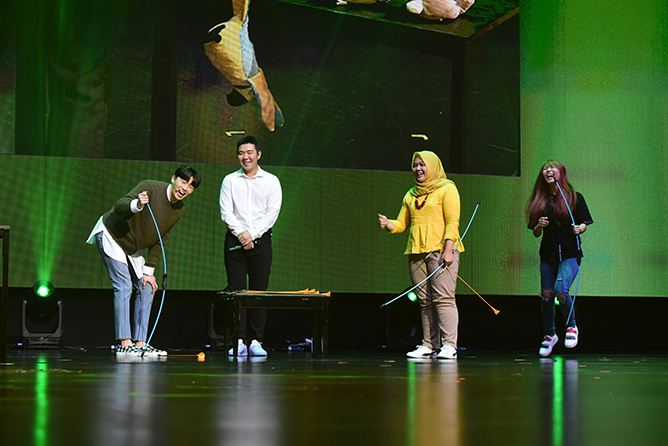 It was a night to remember indeed – what were your favourite #ParkSeoJuninSG moments? Comment down below! It seems like just yesterday that BTS was making history on the Billboard stage, and these K-pop trailblazers are here to tear up the American music scene yet again. Between joining forces with Desiigner for an epic remix of ‘MIC Drop’ and gearing up for their performance debut at the 2017 American Music Awards, the Korean supergroup has also received a love call from The Ellen DeGeneres Show, with executive producer Andy Lassner reassuring that “it’s gonna happen” (inserts jungshook.jpg). Still don’t believe us? Well, the queen has spoken. Whether or not BTS will make an appearance is still up in the air, but it’s never too early to start hyping up our favourite boys. Here are 6 ARMY-approved things we would totally love to see on the show – dance-offs, scare pranks and all. While we couldn’t be more psyched to watch the boys perform their latest smash hit at the AMAs, just imagine how lit their entrance segment would be if BTS kicked off the show with ‘DNA’. We can already see Ellen breaking out into the full routine and J-Hope challenging Ellen to a dance-off. Hey dance line, looks like you’ve got competition! With EXO spawning a series of viral challenges (#KokobopChallenge anybody? ), the BTS-inspired Go Go Challenge is the latest trend to blow up over the Internet – and who better to slay the moves of ‘Go Go’ than the one and only Ellen? Eighth member of BTS, confirmed. #3 What’s Ellen without pulling a prank or two? Y’all might be familiar with Ellen’s penchant for scaring the pants off her guests – not even Taylor Swift, Selena Gomez and David Beckham were spared – so there’s a good chance that BTS will likely become the newest victims of her masterful pranks. We don’t know about you, but we’re particularly looking forward to Jin and J-Hope reactions. Get ready for the memes! As Rap Monster is the sole member fluent in the language, the pressure is no doubt on the leader to take charge of the conversation and sometimes act as the translator, so we do hope there will be an interpreter onsite to help the poor guy out. All seriousness aside, the other members aren’t so shabby at the language themselves (we’re counting on you, Suga)! #6 Powerful people supporting each other! As if we needed more reason to love BTS, they’ve partnered up with UNICEF on the #ENDviolence campaign to commemorate their latest album Love Yourself: Her. With Ellen being a huge advocate of human rights herself, it’s a great opportunity to raise awareness about the cause and cement themselves as a socially-conscious K-pop act. To the world and beyond! What else do you hope to see if BTS x The Ellen happens? Fire away in the comments box below, ARMYs! Are you ready for what’s arguably the hottest version of F4? Another year, another Meteor Garden remake. One of the most popular manga adaptations to date, the aforementioned drama is just one of the many many versions that have been released – Taiwan’s Meteor Garden, the eponymous Hana Yuri Dango, Korea’s Boys Over Flowers, and at least three other ‘inspired’ variations. And it’s starting to seem like the film industry has collectively decided that every generation needs an F4 to swoon over, because 2018’s cast of ultra rich heartthrobs totally fit the bill. 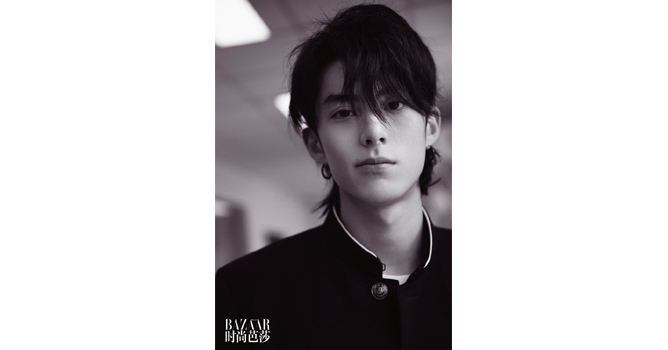 Appearing on the cover of Harper’s Bazaar China for the very first time, the new F4 – comprising Darren Chen, Connor Leong, Caesar Wu and Dylan Wang – quelled the speculations that’ve been running ever since Meteor Garden 2018’s producer, Angie Chai (who was also at the helm of 2001’s production) announced the remake. There’s no word yet on who’s set to play which character, but one thing’s for sure: with each episode budgeted at NT$15 million, which costs roughly 3,000% times an episode of the original series, the pressure is on for these up-and-coming actors. 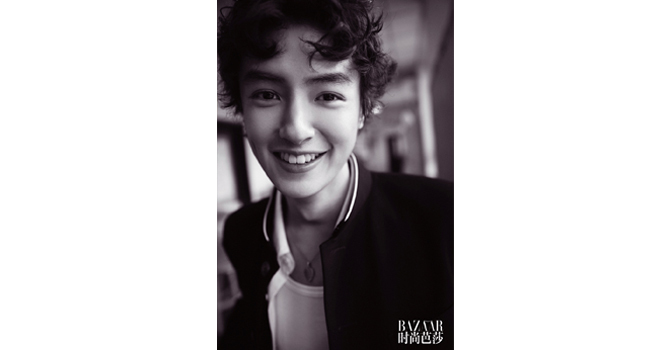 Our prime pick for Dao Ming Si/ Gu Jun Pyo, 22-year-old Darren Chen is a Taiwanese actor who most recently played the second lead role in a 2016 web drama titled Proud of Love. 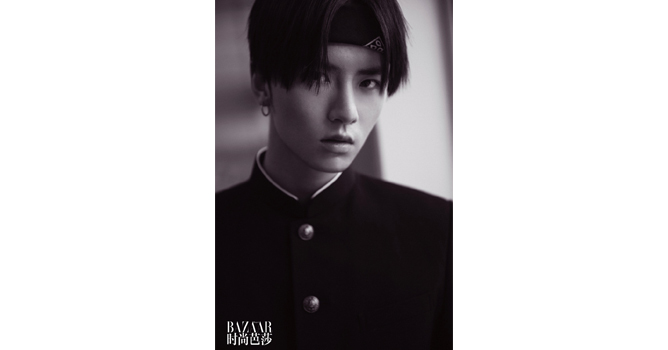 Sporting bad boy looks that could fit Xi Men/So Yi Jung, this 23-year-old triple threat was a regular on an idol reality show and has had a few minor acting roles prior to landing this gig. 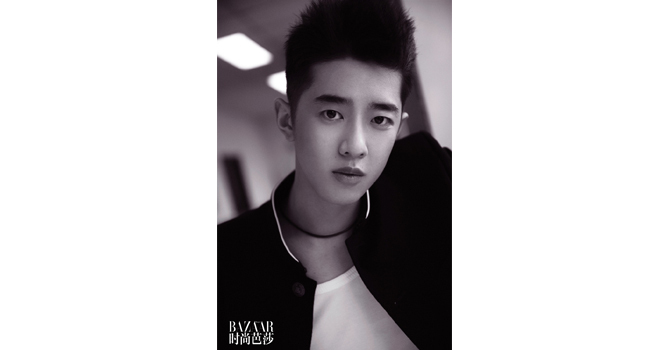 We can’t quite decide if Dylan could play Mei Zuo/Song Woo Bin or F4 leader Dao Ming Si/Gu Jun Pyo. After all, he has the chiselled good looks for both characters, albeit having an air of nonchalance that befits F4’s resident casanova. Alternatively, Dylan could also play the mysterious Hua Ze Lei/Yoon Ji Hoo… Needless to say, this 19-year-old is a definite wild card. It might be the curls and boyish smile, but Caesar Wu kinda reminds us of Harry Styles back during his X Factor days… And he seems to be relatively new on the scene, with little to no info about him on the Internet. Could we be looking at F4’s knight in shining armour, Hua Ze Lei/Yoon Ji Hoo? No prizes for guessing who this doe-eyed beauty plays in Meteor Garden 2018! 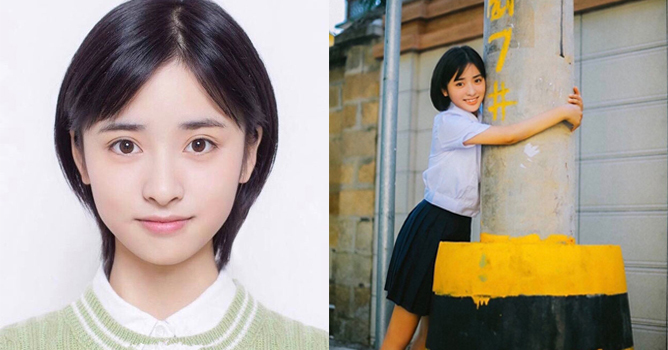 20-year-old Shen Yue’s a new kid on the block (like the rest of her cast mates) with a starring role in A Love So Beautiful. We can’t wait to see how she’ll bring out Shan Cai/Jan Di’s fiesty personality! Which is your favourite version F4? Tell us in the comment section! Sam Smith might be known for his soulful ballads, but he sure knows how to belt a pop jam too. Fresh off the release of his sophomore album The Thrill Of It All, Sam Smith took to the latest edition of The Late Late Show With James Corden‘s beloved segment Carpool Karaoke to remind us why we fell in love with him in the first place. Between pitch perfect renditions of emotional cuts like ‘I’m Not The Only One’ and his latest single ‘Too Good At Goodbyes’, the British crooner dished on everything from his noticeably slimmer frame to his opinion of the hottest celeb (the answer is Ryan Gosling btw). But when elaborating on his dream wedding – which includes a pre-nuptial funeral for his “single self” and guests dressed in all-black before unveiling white outfits – Sam also revealed that the march-in song of his choice would be Fifth Harmony’s scorcher, ‘Work From Home’. Lest we forget James Corden’s knack for landing guests literally wherever and whenever, the host made a quick call. And lo and behold, the fabulous foursome showed up, greeting an ecstatic Sam who couldn’t believe his luck. Cue the bubbling synths of ‘Work From Home’ and it’s like the girl group had it’s original lineup of five members, with Sam taking charge – ad-libs, hand gestures and all. We always knew Sam Smith had diva-worthy vocals, but we’ve never seen him unleash his inner diva quite like this! Sam even commemorated their surprise meet-up with an Instagram post captioned “That moment when all your carpool karaoke dreams come true”. Hmm… could this be a sign of a collaboration in the works? We sure hope so!